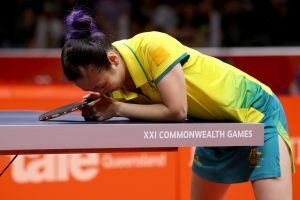 Australia has suffered a heartbreaking 3-1 defeat to England in the bronze medal playoff at the 2018 Gold Coast Commonwealth Games. Tin-Tin Ho got England off to the perfect start, claiming a 3-2 over Melissa Tapper. Kelly Sibley and Jian Fang Lay next up to the plate. Sibley took the first game 11-5, looking to power her way to victory. But the second game would change the tide of the match. Lay went old school, fighting her way to a 21-19 win. The two continued to be neck and neck, and the match was pushed in to a decider. Experience paid off and Lay took the fifth game 11-7 to level the match score 1-1. Australia got off to a slow start in the doubles, and despite taking the second game, couldn’t shift the momentum. The English pairing of Sibley and a tenacious Tsaptsinos took the match to put England in to a commanding 2-1 lead. The next match was to be full of drama as Tin-Tin Ho faced Miao Miao. While the two players battled for dominance, the tension grew to extremes. So much so that Miao received a yellow-red card for time wasting. This shook the Aussie, and timeout was needed to get her back on course. The game was almost over as Miao had to save a match point at 9-10 down in the fourth game. Miao went on to take the game 13-11. But it was too little too late. Ho led from start to finish in the fifth game and sealed Australia’s fate, giving England the win and the bronze medal.